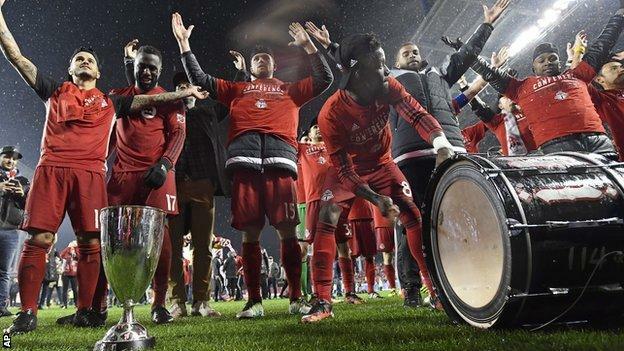 Toronto FC became the first Canadian side to reach the MLS Cup final as a dramatic 7-5 aggregate win over Montreal Impact saw them crowned Eastern Conference champions. Trailing 3-2 from the first leg, they levelled at 5-5 before extra-time goals from Benoit Cheyrou and Tosaint Ricketts sent them through. They host Western Conference champions Seattle in the final on 10 December. Montreal's defeat was Didier Drogba's last game for the club. The 38-year-old ex-Chelsea striker, who has also played for Marseille, Galatasaray and Shanghai Shenhua, had announced he was leaving Montreal at the end of the MLS season.